Outlook 2016 for Mac has some new and improved features coming out over the next few weeks. Office Insiders should see these changes in the newest builds (version 15.33.228 and up), everyone else will see them in the coming weeks. Possibly the most popular is support for Google Calendar and Contacts in Outlook 2016 for Mac. 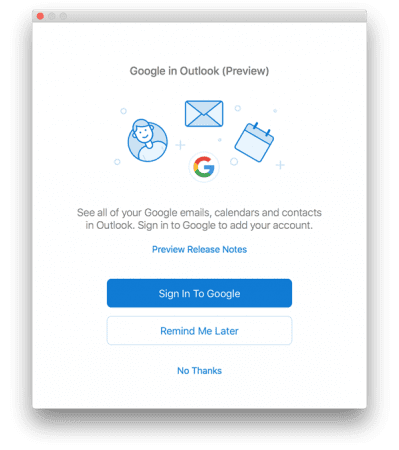 This is in a test phase and is slowly being offered to users adding Google accounts, with general availability later in the year. This uses the "Microsoft Cloud", not CalDAV and CardDAV. This cloud service began rolling out to Windows Insiders a couple of weeks ago (for testing in the Windows Mail app). This will eventually make it into Outlook 2016 for Windows. Office Groups are coming to Outlook for Mac. The first update will allow you to view your top 10 groups in the folder pane and you'll be able to read, compose, and reply to group conversations. More features will be added over time. Adding accounts to Outlook for Mac is a little easier with a new UI and new autodiscover detection service. All you need is your email address and password. As with Outlook 2016 on Windows, it will suggest adding a mail account for the account you used to activate Office. This service includes predefined providers for Office 365, Outlook.com, Exchange, Google, iCloud, Yahoo. Sync your Google account to the Microsoft Cloud. If you want to join the Office for Mac Insider program, all you need to do is check for updates (Help menu) and select Join the Office Insider program then select Fast or Slow. See Office for Mac: Insider Fast and Slow Build for more information.